A few months ago, Kathleen Sullivan was at work when she got a phone call: Her husband had been shot in the shoulder outside of their Richmond home in a random drive-by. The ambulance had taken him to the emergency room at Kaiser Permanente Richmond Medical Center. Sullivan drove there immediately. When she arrived, her husband was lying on a gurney. The paramedics were hovering over his wound, going through gauze after gauze after gauze. "He was bleeding out over everything they were putting on him," Sullivan recalled. When she asked the paramedics what their plan was, they told her that Kaiser Richmond didn't have the resources to deal with that kind of trauma. They were just trying to stop the bleeding so they could take him to a bigger hospital, John Muir Medical Center in Walnut Creek, about 25 miles away. Sullivan was angry. It was ridiculous to her that they were sitting in a hospital that was unable to treat her husband. They were sitting in a hospital waiting to go to another hospital. It was 4 p.m. when they started moving him to John Muir. Traveling down Interstate 80, they were sure to hit bumper-to-bumper traffic. "It's a death trap if it's the certain time of the day and it's a certain thing that's gone wrong," Sullivan said. She didn't feel steady enough to drive herself, so she got a friend to take her. Instead of going down the interstate, they took a shortcut through the Berkeley hills. Seven hours later, Sullivan's husband was out of surgery and stable. The surgeon told her that if the bullet had hit him even a quarter of an inch to the right, he wouldn't have made it. It wasn't so much the wound that would've killed him, it was all those minutes that went by. "If he could have been treated at Kaiser, he could have been saved," she said. Richmond is deep in what's often referred to as a "hospital desert." This desert stretches along the densely populated Interstate 80 corridor from Vallejo to Berkeley, with a population of about 250,000 residents. Besides the 50-bed Kaiser hospital in Richmond, there are only a handful of clinics and urgent care facilities. But there is no fully functioning emergency room in West Contra Costa County, especially not one that could handle a gunshot wound. This puts Richmond residents — who live downwind from a major oil refinery — in a precarious position. 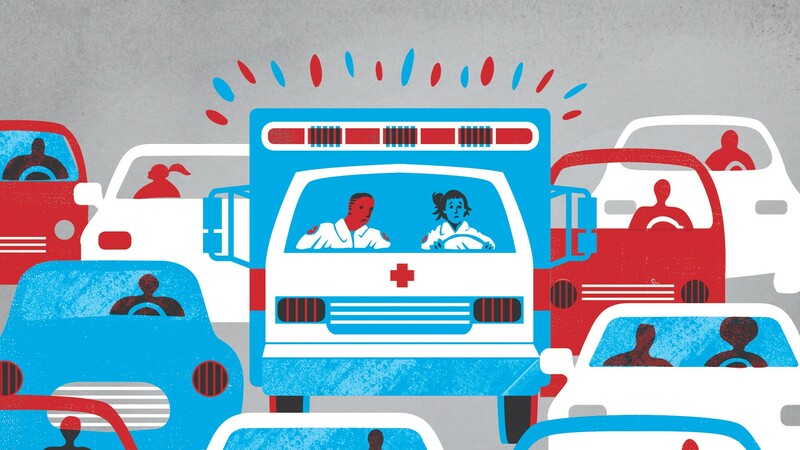 In medical emergencies, Richmond residents rely on Kaiser Richmond, Contra Costa Regional Medical Center in Martinez, and Alta Bates Summit Medical Center in Berkeley. Of these options, only the 300-bed Alta Bates has a fully functioning emergency room. Unlike a clinic or an urgent care facility — which can treat non-emergency illnesses — a fully equipped emergency room can deal with major injuries, heart attacks, strokes, and more. But now, Sutter Health, the owner of Alta Bates, has begun to move in-patient services to its facilities in Oakland. Eventually, the not-for-profit health system plans on relocating emergency services to Oakland as well. The effects of this move will likely ripple throughout the East Bay, but the impacts will be most felt in West Contra Costa County, which is already suffering from the loss of Doctors Medical Center in San Pablo in 2015. Sutter Health has publicly stated that it is not closing Alta Bates but merely moving in-patient and emergency services to Summit Medical Center in Oakland. According to a press release, Sutter Health is looking into ways to repurpose the Alta Bates campus "for medical services and/or support staff office space." It said the consolidation comes after the passage of Senate Bill 1953, which requires that all California hospitals either retrofit their buildings to meet stricter earthquake safety standards or cease to operate acute care services in those facilities by 2030. Although Sutter Health argues that the consolidation will be better for patients, many worry about the effects this could have on East Bay residents. Specifically, critics of the move are concerned about travel times along I-80 in an emergency situation. Thorild Urdal, a longtime nurse in the labor and delivery unit at Alta Bates, has seen how crucial every minute can be in an emergency situation. Driving the 11 or so miles from Richmond to Oakland can take an hour in rush-hour traffic. If someone has a major heart attack, she said, that hour can be fatal. "There's certain emergencies — if they're true emergencies — every minute can count," she said. Berkeley Mayor Jesse Arreguín said this issue goes beyond Berkeley and puts the lives of every resident in the East Bay at risk. "Where are you going to go if you have a heart attack? What would happen if there's a fire or an earthquake?" he said. "It's going to leave our community without basic health-care services." Located on Ashby Avenue in Berkeley, Alta Bates has served the East Bay community since its founding in 1905 by a nurse named Alta Alice Miner Bates. Over the years, the tiny hospital grew into a valuable maternity center and provided care to the community through several catastrophic events, including the Loma Prieta earthquake in 1989 and the Oakland firestorm of 1991. In 1996, the hospital became part of Sutter Health when the Sacramento-based hospital network merged with Bay Area-based California Healthcare System. Two years later, there was a proposal to merge Alta Bates with Summit Medical Center in Oakland — the East Bay's two largest hospitals, located just 2.5 miles apart.